The Step Forward Group meets every second Wednesday of the month at Hospital Family Resource Centre from 10.30am to 12.30pm. The group is always open to new members. Recognising the lack of a voice for people with disabilities in the area, Hospital Family Resource Centre worked with local volunteers to set up a training course on equality issues targeting people with disabilities in 2004; from this training a group of people came together and set up the ‘Step Froward Disability Group’, to give a voice to people with disabilities and carers. 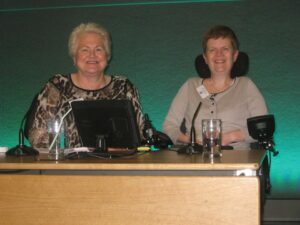 One of the reasons the group came together is to be involved with others like themselves, so they can relate to each others experiences and give space to group members to support each other, share information and lobby around disability issues impacting on the lives of people with disabilities and carers in the community. All of the group are involved with disability; some have a disability and others have family members with a disability or have an interest in volunteering with the group. Group members come from the communities of Charleville, Kilmallock, Bruff, Ballylanders, Bulgaden, Hospital and Knocklong and all experienced the unique isolation people with disability experience in the community. Disabilites represented in the Step Forward Disability Group are: Sensory, Physical, Motor Neuron, Acquired Brain Injury, Intellectual Disability, & Post Polio. We believe all people should be treated equally with respect and unconditional acceptance. We strive to see the ability not just the disability and to acknowledge and support the talents and achievement of all people. We believe that people who have a disability have the right to be personally independent and to have the training needed to do so. Equally, they have the right to seek the help they need and to be treated with dignity at all times. Fundraising for Irish Guide Dogs, Pieta House, Special Olympics and St. Joseph’s Foundation etc. Position papers on cut back to Rural Transport, HSE cuts etc. 1.9 – Annual PR Planner – Awareness Raising & Highlight FRC work through events. Presentations on Mental Health, Disability Advocacy etc. Rural Bus supports the Step Forward Group members with transport to attend meetings.